A new Taub Center study by Michael Shalev documents the relative economic decline experienced by young, educated native-born Israelis who were at the forefront of the 2011 protests. Spontaneous protests over economic conditions usually break out among disadvantaged populations, as occurred in Israel with the “Black Panther” riots at the beginning of the 1970s. But the mass housing protests of the summer of 2011, which drew hundreds of thousands of participants, were led primarily by educated young people from middle class backgrounds. While some have questioned whether the protestors really suffered from economic distress, a new study by Prof. Michael Shalev, outgoing Chair of the Taub Center Welfare Policy Program, documents that members of this group did indeed experience a substantial decline in their relative economic standing during the years leading up to the protest. The research – using data from the annual Income Survey of Israel’s Central Bureau of Statistics – examines income distribution in Israel across population sectors over a 15-year period. Shalev’s main finding is that young (25-34 year-old), educated Israeli-born Jews living in the center of the country – in the past, a fairly privileged group in terms of their economic standing – have, as a group, lost ground in relative terms, and in some cases even in absolute terms, over the last decade. Figure 1 shows the decline in fairly sharp relief. It focuses primarily on the group that was the backbone of the 2011 protests: young working families of Israeli-born non- ultra-Orthodox Jews. (A “family” here refers to a couple with at least one child and at least one working spouse.) 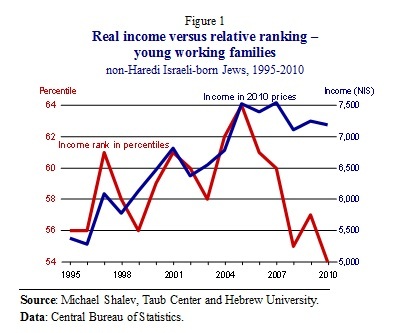 The blue line in the figure shows the average real income of such families over the past fifteen years (i.e., in 2010 shekels, discounting inflation). While incomes rose steadily from 1995 through 2005, they have since stagnated and even declined slightly. The red line shows an even starker contrast – focusing on the relative income of this group in comparison with the entire population, which is divided into 100 equally sized percentiles (shown along the left vertical axis in red). The position of the median young family – relative to the overall population – is depicted by the red line. From 1995 through 2005, which could be termed as “the years of the young,” the income of the median young working family of Israeli-born non-Haredi Jews rose in comparison to the rest of Israeli society. By 2005, this median young family rose to the 64th percentile of all Israeli families, and then came the downturn. It continued fairly steadily, falling to the 54th percentile by 2010, wiping out all of the relative improvements since 1995, and then some, leaving these families earning barely more than the median Israeli family. The 2011 protests in Israel were not centered in or on the development towns or the poor neighborhoods; the largest of the tent cities was set up in close proximity to Israel’s primary financial district. Figure 2 suggests one possible explanation. The figure shows nominal wage growth for individuals of different age groups from the relatively affluent 2005-2008 period to the post-crisis 2009-2010 period. The Taub study shows that wage growth for virtually all cohorts failed to keep up with the cost of living, but for young employees (under the age of 35) with higher education living in Israel’s central region, things took a particular turn for the worse: they saw 1-2 percent declines in their nominal wages at a time when prices rose by 9 percent. The Tel-Aviv protests focused mostly on housing. The study finds that an increasing proportion of young adults continue to live at home with their parents, although this mainly reflects the tendency among all groups (except Haredim) to postpone marriage and children. Figure 3 shows that home ownership has been declining among young, educated native-born non-Haredi Jews – the majority – who have established their own families. While the share of families in the lowest income quintile who owned an apartment remained relatively unchanged over the past decade – just over half – the share of home-owners declined substantially for the middle and upper income quintiles in recent years. In 2000-2004 almost 80 percent of young families in the top income quintile owned in apartment; by the end of the decade, in 2009-2010, this share declined to just over 60 percent. However, it may be that the retreat of middle and upper income young families from home ownership is due not only to rising prices, but also to changing lifestyles that have drawn rising numbers of even the most affluent young couples into rented housing. Young Arab and Haredi families, who ranked very low to begin with, also moved down the national income hierarchy. On the opposite end of the spectrum, young, educated Israelis born in the former Soviet Union (FSU) have seen impressive economic advances in recent years. Figure 4 displays the main reason for this: their rising individual earnings in the labor market. The graph shows the hourly wage of median young earners from different population sectors with an academic education, measured in percentiles relative to the entire workforce. It highlights two five-year periods, 1995-1999 and 2000-2004, with the subsequent six years broken down into the pre-crisis years 2005-2008 and the post-crisis years 2009-2010. Both men and women from the FSU saw large, steady increases in their relative incomes during these years; these individuals overtook 17 to 20 percent of their fellow young working Israelis in a period of only sixteen years. Shalev attributes these gains to the adjustment of early young immigrants to local conditions, and to the increasing numbers of young Russians who grew up and were educated in Israel. By contrast, university graduates among Israeli-born Jews and Arabs lost ground. The fact that non-Haredi, Israeli-born Jews have suffered declining relative personal and family incomes is indicative of the economic erosion that has affected even previously privileged sections of the younger generation. Shalev points out that in the past young members of the Israeli-born group benefited from a number of advantages in entering the middle class: higher education, residence in Israel’s center, later marriage and more dual-earner couples. Shalev finds that these “middle class advantages” continue to confer an income bonus compared to other Israelis, but that the relative amount of this bonus has eroded in recent years.